The BRV-105 looks a bit like a short mushroom. It’s a squat cylinder with a 2.9-inch speaker surrounded by a beefy wall of protective plastic. Braven offers this speaker in black, blue, grey and red. Our test model is black. The whole unit is 3.7 inches across and 1.3 in. tall. It’s 0.4 pounds (6.4 ounces.) This speaker not pocketable but still easy easy to carry around. A significant aid to that portability is the stretchy strap. This is 0.9 in. by 4.4 in. 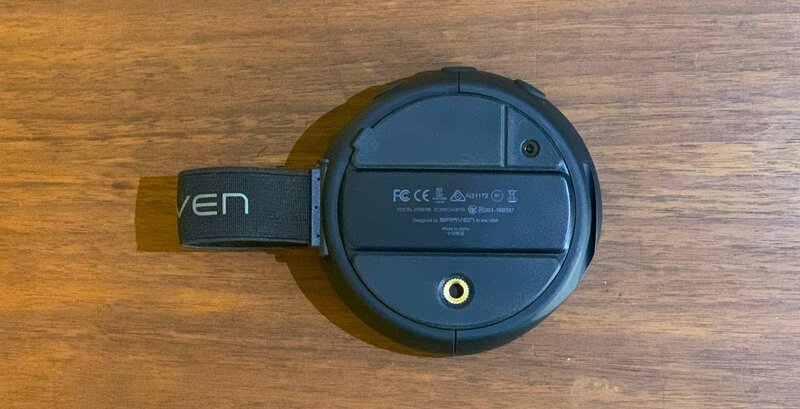 One end is permanently affixed to the side of the BRV-105, while there are slots to attach the other end either on the same side to make a loop, or on the other side of the speaker so it stretches across the bottom of the unit. The slots hold the strap very firmly, with little chance of them slipping out. The BRV-105 is palm-sized and easily portable. There are three large, easy-to-use buttons on the edge: power, volume up and volume down. These do double duty for play/pause and skipping ahead or back in song tracks. The device is easy to control even with gloves on. On the bottom, behind a protective door, is a micro-USB port to charge this accessory. There’s also a 3.5mm audio port, so you don’t have to always use Bluetooth. The protective door is instrumental in the BRV-105 receiving an IP67 rating, which means it can survive being submerged in up to 3.3 feet (1 meter) of water for up to 30 minutes. The rating also indicates that it won‘t be damaged by exposure to dust — the kind you breathe on a trail, not what you wipe off your credenza. It floats. We tested to be sure. There’s a 1/4-inch thread mount on the back as well. So if you have a mounting station on your bike, you can attach this accessory really securely. 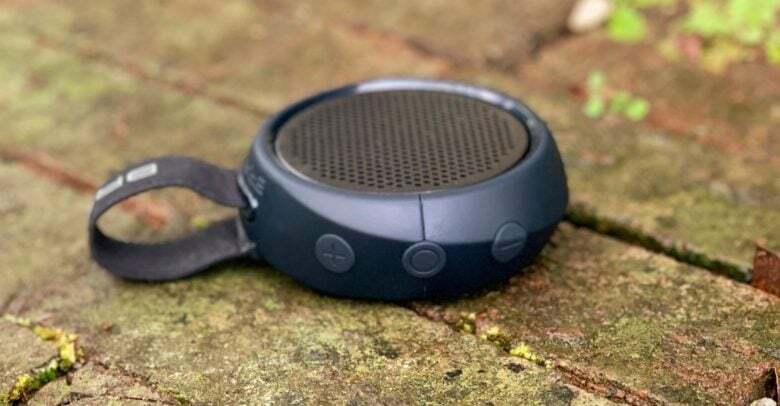 This speaker is capable of putting out enough sound for its intended purpose: you can listen to music or podcasts on your bike, in a campsite, or maybe a canoe off that’s your thing. In a semi-scientific test using the iOS NIOSH Sound Level Meter app in a quiet room, the BRV-105 was able to put out as much a 102 dB. That’s loud enough that if you listened to it for 15 minutes you risk hearing damage. Audio quality is what you’d expect from a smallish speaker. Base is a bit weak, but sound isn’t tinny. We listened to a variety of music styles and podcasts with this speaker. You’re not going to get the subtleties of a Brahms concerto, or the thundering bass of “Radioactive” from Imagine Dragons, but overall music should sound acceptable to anyone who’s not a hard-core audiophile. You can also use the BRV-105 to make and receive phone calls. There’s even noise-cancelling tech to make the audio clearer. In our tests, audio quality on both ends of the call was outstanding. Braven promises the 800mAh battery is good for 8 hours of music playback on a single charge. That’s going to vary a bit depending on how loud you play your tunes. The iOS battery meter in the Today Screen shows how much power is left in the speaker. Braven’s portable speaker comes in handy in situations where you don’t want to use headphones, either because you don’t want to block out other sounds or because the risk of losing your AirPods is too high. The BRV-105 is palm-size and waterproof, ready to take on an adventure or two. The price is $49.99, which is typical for a small but good-quality Bluetooth speaker. Braven/Zagg provided Cult of Mac with a review unit for this article. See our reviews policy, and check out more stuff we recommend.